Flexible packaging solutions provider Comexi is set to showcase a range of printing and converting solutions at this year’s Interpack event in Düsseldorf, Germany. The firm’s current printing and converting solutions portfolio is comprised of flexo, offset, gravure, laminating and slitting solutions, which can be used in different marketing applications. At the event, the company will showcase Comexi F2 ML flexo press that is designed for high volume market. It can be operated at high speeds with large repeats. 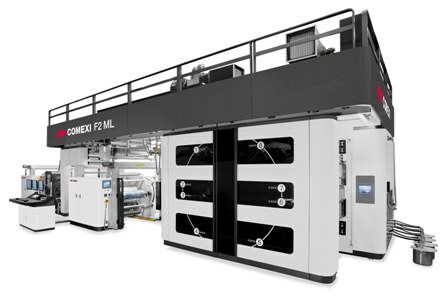 Comexi will also exhibit F1 flexo press, which enables to meet the requirements derived from job changeovers of machines with large repetitions. Comexi ML1 and Comexi SL2 products will also be exhibited at the event, which can be applied for different solutions in laminating with and without solvents. The firm will exhibit heat seal coating, varnishes with barrier properties and cold seal solutions, in addition to solutions developed for final packaging of the product. It will also exhibit L20000 water-based laminating machine for solving digital printing queries and Comexi Cingular Laser that can be incorporated online with its machines for accurate results in drilling applications. Comexi S1 DT slitter, which features inspection camera and resealable equipment, is said to provides enhanced levels of quality and productivity. Image: Comexi F2 ML flexo press. Photo: courtesy of Comexi.